The main page of Xtra contains shortcuts to the most used features (configurable) as well as the custom links section, version info for Xtra (and CPX if installed) as well as the style selector. To select your style simply click one of the colors listed between the main menu and the shortcuts section. After a brief 1 second delay Xtra will change to your chosen color scheme. This feature is cookie based so as long as you don’t delete your cookies it will automatically remember your preferred color selection the next time you log in. 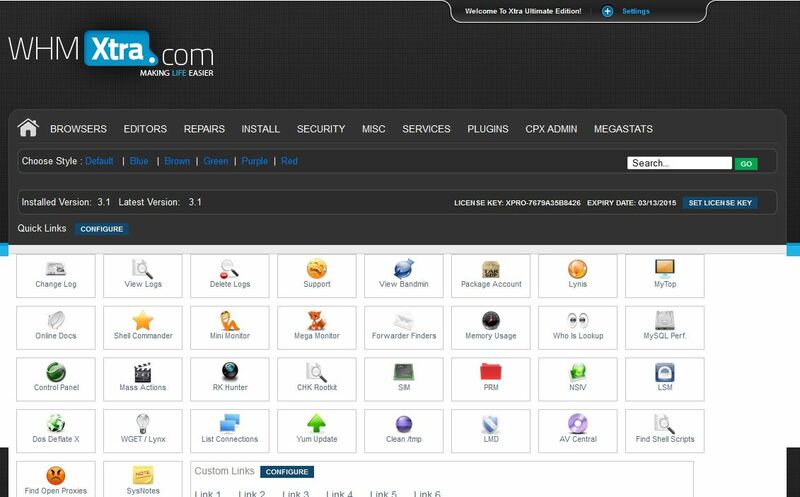 You can also configure the custom links, view your license info, use the search feature, and access the settings menu, which allows you to set your default language, set your mysql root password, upgrade Xtra or your license key as well as control a number of options for displaying Xtra features in WHM’s plugins menu.